Global cartography leader C-MAP® announce today its new series of map products for American boaters is now available for purchase. These new mapping products — C-MAP Insight Pro and C-MAP Lake Insight HD— combine the trusted chart detail, unique content and popular graphical presentation of C-MAP cartography with exclusive chart data from GoFree® Lake Insight charts. Boaters and anglers using these charts will also benefit from millions of acres of customized data from the Insight Genesis® Social Map, providing the most up-to-date views of underwater contours and lake bed features gathered and shared by actual boaters on the water. New C-MAP Insight Pro gives both coastal and freshwater anglers powerful features designed to enhance their time on the water. These include high-definition 1’-3’ depth contours for thousands of lakes and bodies of water, many enhanced with shaded depth contours that make it easy to pinpoint productive areas. Additional angler-specific features include a custom color palette for user-defined depth ranges, state fish and wildlife regulations/fishing records and a wealth of Fishing Hot Spots® POIs and lake-specific fishing tips and techniques. 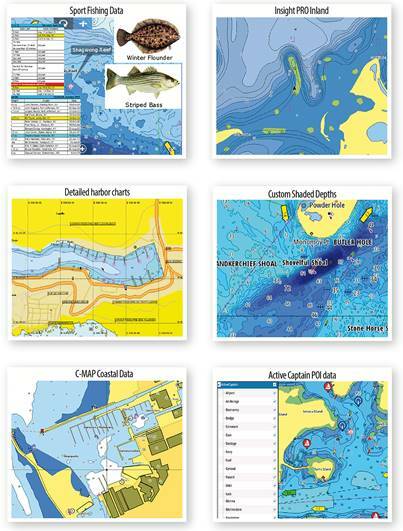 Exclusive C-MAP High Resolution Bathy (HRB) chart detail is a powerful ally for coastal anglers. These charts also provide boaters with many of the advanced navigation features popularized by C-MAP, including an extensive Harbor Charts and Ports Info database, Active Captain® crowd-sourced POIs. New C-MAP Insight Pro charts deliver all this data and content on a single SD card covering the contiguous United States. New C-MAP Lake Insight HD offers all the Lake related features and content of C-MAP Insight Pro, along with additional popular C-MAP features including Satellite Image Overlay and Aerial Imagery for enhanced situational awareness and a “bird’s eye” Perspective View chart presentation. These new charts are offered as a charting option and embedded cartography for Lowrance®, Simrad® and B&G® displays and, as a result of the further development of the Insight offering to a broader audience of boaters and fishermen, Raymarine and Furuno customers will be able to access Insight products when made available in upcoming C-MAP 4D releases. For more information on C-MAP Light Marine and Commercial products, visit www.c-map.com.